Artist Douglas Fry was a keen hunter, described by a contemporary as ‘a tall, lean, monosyllabic Englishman who had an intensely conservative mind and a pronounced Oxford accent, and looked as if he had been poured into his riding pants and boots (which he always wore)’. Fry was born at Ipswich, Suffolk, England, in 1872 and studied art at the Académie Julian in Paris. When he arrived in Australia in 1899 he initially earned his living doing commercial work, first in Melbourne and then in Sydney. In Sydney he showed regularly with the Society of Artists and in 1908 his painting Mountain King was purchased by the National Art Gallery of New South Wales. Among his contemporaries Fry was considered a skilled animal painter. He was a keen horseman and is said to have taught Norman Lindsay to ride. 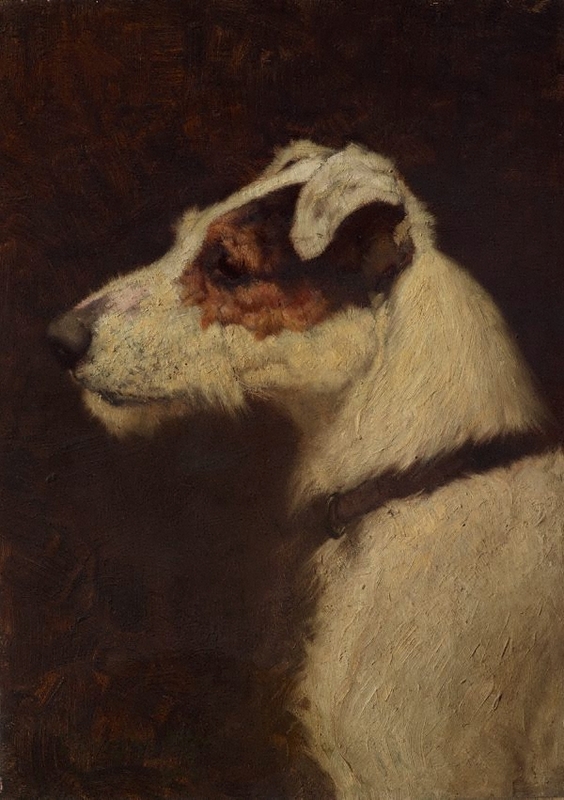 He also shared a love for terriers with Lindsay, titling this work, of a Parson Russell Terrier, 'My best friend'. The painting was presented to the Art Gallery of New South Wales by the important art collector Howard Hinton in 1915, initiating a series of gifts which enriched the collection by 150 works. Fry died of pneumonia in 1911, at the young age of 39. Signed and dated l.l. corner, brown oil "DOUGLAS FRY/ 1910".